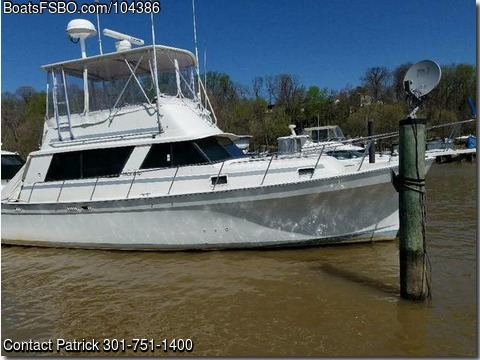 Boat is located in Fort Washington,Md.Please contact the owner @ 301-751-1400.. Sharing the same hull as the 36 Double Cabin, the Mainship 36 Sedan (also called the 36 Nantucket) has the interior space and comfort of a much larger boat. Indeed, the salon dimensions are unusually generous due to the fact that the cabin bulkhead is located well aft, increasing the interior dimensions at the expense of cockpit space. A comfortable cruising boat, the profile of the 36 Sedan is on the boxy side. Inside, there are two staterooms on the lower level as well as a stall shower in the head. Both the galley and dinette are located in the salon the décor features attractive light oak woodwork and, with the dinette converted; there are berths for six. A second benefit of the extended salon is seen in the spacious flybridge, where L-shaped lounge seating is provided aft of the helm. A helm performer with standard Crusader 270-hp gas engines, she'll cruise at 17 knots and reach 25-26 knots wide open. The Mainship 36 Sedan is a roomy boat, with accommodations comparable to larger boats, such as a full shower stall, 3 beds and two staterooms, generator and 2 Air Conditioning systems. The engines run great and are very economical for gas engines. It has a full electronics package including Satellite dish with Gyro, open array radar, fuel flow metersColor Fish Finder, Auto Pilot integrated to both Radar, GPS and Garmin Chart Plotter. It has a custom made hardtop, and a 2017 full bridge enclosure. All exterior and interior bulbs are changed to economical LED. Mechanical Upgrades Michigan Wheel NIBRAL Brass Propellers, PSS Shaft Seals, Electronic Ignition, FLOSCAN Digital Fuel Flow Meter, Large Raycor fuel Filters, Remote Oil Filter Kit, AMSOIL Dual Oil Filtration kit with Remote Oil Filter Kit (on Main Engine and Generator), New Batteries, Digital Tachometers, bottom barrier coat.